I'm a writer and poet who dabbles in photography. I'm interested in many things and love to learn new stuff. In anticipation of the winter blahs. Disclaimer: I don’t like to shop at Walmart, but sometimes it is my only option. Shopping is very limited in Laramie. Sometimes, the only place I can find a thing in town is to go to Walmart. So I did. 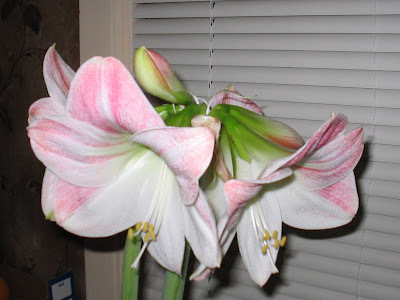 I went to Walmart yesterday and bought two amaryllis. They each came in a box which had a big tablet of compressed growing medium (just add water), a pot and a big bulb. I planted them this morning. According to the blurb on the box, they should bloom in 8 to 12 weeks. That will be anywhere from the middle of January to the middle of February, just when the long, cold winter is starting to get a bit oppressive. With luck we should have some spectacular blooms to provide relief and remind us than it is just four more months until spring. Author mastoutPosted on November 19, 2007 Categories Uncategorized1 Comment on In anticipation of the winter blahs. It’s the middle of November and after a long and warm fall, the other shoe is about to drop. It is almost 60 today and will be almost that warm tomorrow, but on Tuesday, when all of UW is poised to hit the trail to grandma’s house, the other shoe will fall. The forecast is for snow and much colder temperatures. Highs in 20’s and lows in the single digits. This is the kind of weather we usually have this time of year. One of the Thanksgiving traditions in this part of Wyoming is a Thanksgiving blizzard making travel difficult, and getting to the airport in Denver damn near impossible. I’m supposed to fly out of Denver on Wednesday. When my daughter was here for a visit this summer, she invited us to come to Austin for Thanksgiving to get out of the cold. I would have been just as happy to get out of the nice fall weather we have been having and not have to drive on ice in the horizontal snow. Stay tuned to see if 1. the blizzard arrived on schedule, 2. DIA is so backed up because of the weather that they start serving turkey sandwiches at McDonald on the concourses, 3. Whether they close all the roads out of Laramie so that I miss the turkey sandwiches at McDonalds. Can you tell I am a bit pessimistic about this trip? This morning I took the dogs up to Happy Jack to walk the trail that runs by a series of beaver ponds along Pole Creek which have been constructed over the years. I saw what looked like fairly fresh moose poop right on the trail. Moose poop is easily identified. It looks like rabbit pellets only it is about the size of the first joint of my thumb. If you smash a pellet open, there is what looks just ilke sawdust on the inside. Moose eat lots of willows and the sawdust is what’s left after it has been processed. I think the mooose must not have been long gone because the dogs keep circling around and stay a long time in the willows. A couple of months ago, we spotted two moose in the willows on the far side of one of the ponds. The prevailing southerly winds kept our scent and any sounds we made away from them, so we got to watch them for a while. 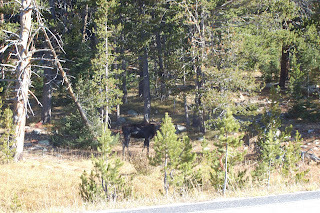 It is always exciting to see moose because it happens so rarely. Mosse are usually very shy and timber up during the day. Moose are shy. They are also usually solitary. You may see a cow and calf or maybe twins, but it is very unusual to see several moose in the same spot. Last fall Konza and I saw a group of five up in the Snowies right along the highway. Of course I got very excited and took many pictures. Thank goodness I had the camera along. The group consisted of a bull, a cow, what looked like a previous year’s mostly grown calf and twins from this year. 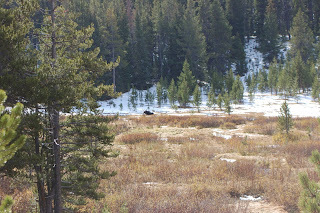 There was another bull laying down in the willows on the other side of the flats. This is the bull. Moose are huge, ungainly looking animals. However, they can move quickly when they need to. Like most animals they would rather avoid confrontation, but will charge if threatened. Their kicks are vicious. This cow had two calves. 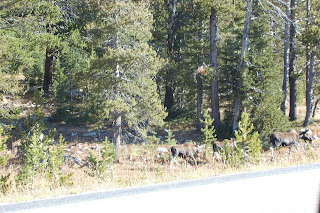 I wasn’t able to get a good photo of the fourth moose in this group. Here’s the best I could do. I think that this was an older calf. I don’t know much about moose rut habits, but don’t imagine the other bull which was much larger would have tolerated this one if it wasn’t part of the family. It is in the center of the picture looking right at us. As I mentioned there was a fifth moose on the other side of the flat. He seemed to be unpreturbed, just relaxing and chewing his cud. 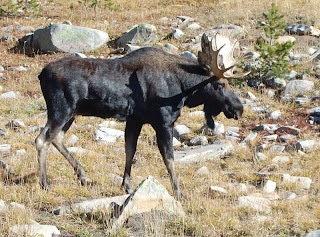 One of the silly things we do when we see a moose is recite Arlo Guthrie’s poem about moose. I seem to be having a tougher time adjusting to the time change this year. I haven’t fallen back very gracefully. Winters are long here in Laramie. We usually have our first snow in September and by Halloween winter has come to stay. Not so this year. Our first snow wasn’t until October and it is still warming into the 50’s during the day, though the temperature drops like a rock when the sun goes down. Maybe that’s part of the problem. Winter was coming slowly this year. Fall was going down like a tire with a slow leak. It was warmer than usual and it was still light when I walked home after work. There was even time to go up to Pole Mountain for a hike some evenings. Then the time changed. Now, the sun has already set by the time I leave work. In a couple of weeks I will be walking home in the dark. The dark is the problem. The dark seems darker in the winter. At least it does when there is no snow and no moon. The winter dark is confining. It closes down like a thick, heavy blanket. I avoid going out again once I get home. The older I get the less I like to go back out. This dark will last for almost four months. The days will continue to shorten until the winter solstice when they will be only 9 hours and 11 minutes long. Then slowly the light will return. We have talked about living in Alaska. I don’t know that I could deal with the dark there when the sun is up for only 5 hours and 27 minutes in Anchorage. Last entry, I mentioned that I was reading a book that was pretty awful. I wondered why I kept on reading it. I think I was hooked just enough in the story to keep going. Last night that all changed. I found myself skimming and skipping pages. Time to cast that crummy book aside; so I did. Some people really get upset when I mention that I start books and don’t finish them. They are folks who are held prisioner by bad literature. That’s too bad since painful reading may turn them into nonreaders. They start books and keep on plugging awat, even though the book has no redeeming qualities and worse they aren’t enjoying it. Now, I do believe that you should give a book a chance. Something about it attracted you so that you picked it up and started reading. Some books are slow starters and don’t get going for a chapter or two. Nancy Pearl , she of Book Lust fame, a prodigious reader and recommender of books, uses this guideline for when to give up. She suggests that you should subtract your age from 100 and read to that page. If the book hasn’t captured you by then, put it down. Just because you put a book down doesn’t mean it is forever banished from your bedside table (That’s where I keep the books I am reading because one of my very favorite, life long pleasures is to read in bed.) I often pick up discarded books week or even years later and read them with relish. Maybe it wasn’t the book, maybe it was me. I may not have been ready for the book at the time I tried it earlier. Of course, there are lots of just plain awful books out there. I can’t figure out how some books got published. I’m not taking about taste. I’m talking about poor writing and worse editing. I don’t know if I would religate Aunt Diminty to the trash heap. The series is, after all, just light fiction, meant solely to entertain. Since the series goes on and on, I must assume that a fair number of people enjoy the books and keep on buying them. I don’t think I will ever again be among them. There are just too many really enjoyable books waiting out there for me to find and read them. Author mastoutPosted on November 3, 2007 Categories UncategorizedLeave a comment on So many books, so little time. I recently read two books I really enjoyed. The first I finished a couple of months ago was Eat, Pray, Love by Elizabeth Gilbert. This was a fun read for me. I did not identify with her particularly which I often do when I get “into” books, but I really enjoyed reading her story as she eats her way through Rome, goes to be with her yogi in India and travels to Bali where she finds love. The second was a foodie book The Julie/Julia Project by Julie Powell. This is the story of one year when Julie gets her life back by cooking her way through Julia Child’s Mastering the Art of French Cooking. Again, I didn’t identify strongly with the writer, but enjoyed her story. Julie swears and cooks her way through the year and comes out a changed woman. Unlike the blog which is a lot about cooking, the book is more about Julie, her husband Eric and their friends and famliy. This does not detract. I recommend both to readers of memoirs and nonfiction. Having finished these two, I picked up a mystery from my to be read shelf. I’d already read a couple in this series, but after I started Aunt Diminty’s Good Deed by Nancy Atherton. I wondered what I was thinking. This series of mysteries involve a ghost, Aunt Diminty, and a grown woman who still consults with her stuffed rabbit from childhood and thinks that she is resposible for the damnest things, like other people’s actions and thoughts. It’s pretty awful. Wonder why I keep reading it. One of the points of my compass is Dogworld. Dogs have always been a part of my life. Some have been more special than others, though all have been loved and given a good home. Konza was the most loved of all. Yesterday, Gail and I went up to the mountains and took a special collar to leave. Gail had been so upset when Konza was put down that she forgot to keep her collar. She ordered this one which we left at a place we call look out. 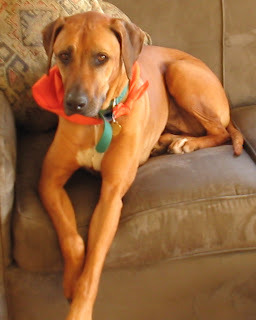 I guess that it has taken us 10 months to be able to leave the collar this says a lot about how much we miss that dog. She was a joy and a royal pain, but she loved us as fiercely as we loved her.